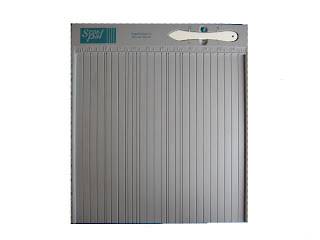 Scor-Pal® creates accurate and precise scores giving you professional looking folds, no more crooked cards. Multiple scores are done in seconds without moving the paper. Perfect for accordion folds, boxes, fancy fold cards and other interesting projects! Scor-Pal is a great tool to use in making the baby box I have done below. Scor-Pal. Price is $38.95 plus shipping.